This Sunday afternoon, while Spouse was busily ensconced with a computer project, I sat nearby and shredded some previously-scanned papers. It was not a years' worth, nor was it a culmination of months of effort. It was, at most, the scanning work of one week. I try to scan about thirty or so a day, or more if I can, and at the end of each week I set to work a-shredding what we have harvested. My Spouse, having a moment to spare, turned around to say hello while I worked and for an instant could not find me at all. 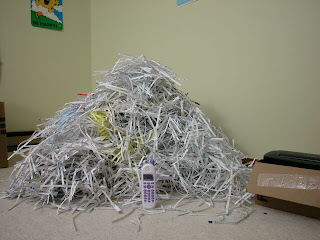 Spouse could not believe the gathering, the heap of shredded statements and old receipts. I myself was stunned: in the middle of the pile, I was too busy to see the mountain growing and towering above my head, or my knees when standing. I enjoy the scanning process, and then feeding the pages to a hungry shredder. I get particularly enthusiastic about feeding the shredded pieces to the dumpster in our apartment complex. On Monday morning I will say a welcomed farewell to all that paper which we are now permanently free from and which no longer will be carried with us every single time we change address. That was but one small, insignificant demonstration of the masses of paperwork we have accumulated over many years. Further, it is evidence of the old adage that hard work is always worth the effort in the end. We have many miles to go before we are paper-free but it would seem as though we are indeed well on our way.